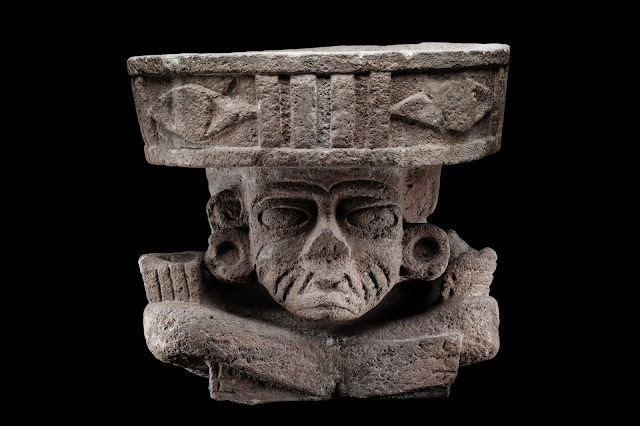 The Los Angeles County Museum of Art presents City and Cosmos: The Arts of Teotihuacan, a groundbreaking exhibition featuring new archaeological discoveries from the ancient city’s three main pyramids and major residential compounds. City and Cosmos includes nearly 200 works in various media, such as monumental sculpture made of volcanic stones; polychrome mural paintings; and smaller-scale objects made out of precious greenstones, obsidian, and ceramic. Organized in collaboration with Mexico’s Instituto Nacional de Antropología e Historia (INAH) and the de Young Museum, Fine Arts Museums of San Francisco, City and Cosmos provides an extraordinary opportunity to see these objects, many of which have never been exhibited in the United States. 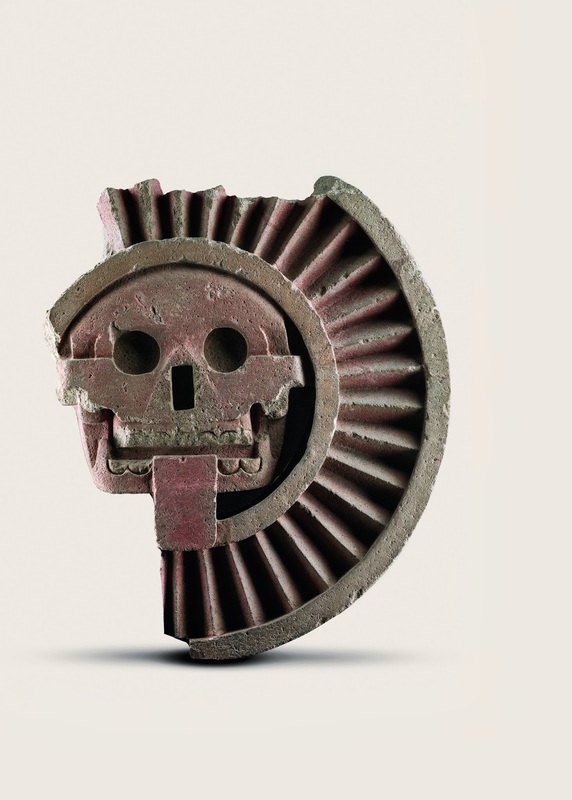 “Shaped over centuries by many different peoples and cultures, Teotihuacan was one of the most significant civic centers in the Western Hemisphere,” says Michael Govan, LACMA CEO and Wallis Annenberg Director. “Telling its complex and cosmopolitan history is especially relevant to a place like 21st century Los Angeles, where nearly 200 languages are spoken." 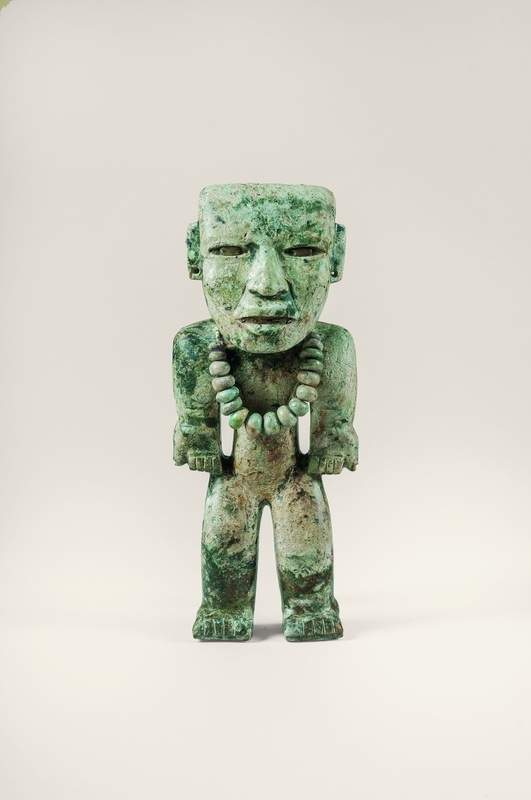 Prior to its presentation at LACMA, the exhibition is on view at the de Young Museum in San Francisco under the title Teotihuacan: City of Water, City of Fire (September 30, 2017–February 11, 2018). The objects were selected by the exhibition’s organizing curator, Matthew H. Robb, now chief curator of the Fowler Museum at UCLA, in close consultation with INAH archaeologists in charge of excavations at the site. The ancient city of Teotihuacan flourished in central Mexico in the first millennium CE and was the largest urban center in the Americas in its day. Highly organized and densely populated, it was built in a grid-like plan over roughly 8 ½–9 ½ square miles. City and Cosmos focuses both on the main pyramids and residential compounds to explore the central question of how the city worked to create a cohesive civic identity. Featuring both monumental sculptures and buried offerings, the exhibition also emphasizes how artworks relate to place, both above and below ground. New discoveries reveal that both visible and buried works were arranged in specific ways to commemorate the city’s ancestral foundations and to forge relationships with vital, essential forces such as fire and water. City and Cosmos is organized according to the city’s main architectural complexes and highlights visible monumental sculpture and buried offerings from the three main pyramids: Sun Pyramid, Moon Pyramid, and Feathered Serpent Pyramid; residential compounds; and the city’s edges and beyond. The exhibition begins with the astonishing new discoveries from , the name given to a staggeringly rich underground offering discovered in 2003 by a Mexican archaeological team led by Sergio Gómez Chávez. The archaeologists found a tunnel underneath the Feathered Serpent Pyramid, and buried inside was an astounding collection of objects notable for their complexity and quantity. In a simulation of the cosmic underworld, the tunnel depth reaches groundwater; its walls are studded with spheres of earth covered in pyrite that gleam when light is cast on them, creating a star-filled underworld evoking the night sky. In this sacred space, the people of Teotihuacan offered rubber balls, slate and pyrite disks, feline skulls, thousands of fragments of wood and rubber, and seeds. Near the tunnel’s final chamber were four sculptures, two of which are featured in this gallery, made of precious greenstones, some apparently carrying bundles of greenstone jewels and pyrite mirrors and disks, items typically used for divination ceremonies. Placed in this significant location, they are thought to represent the ancestral founders of the city. 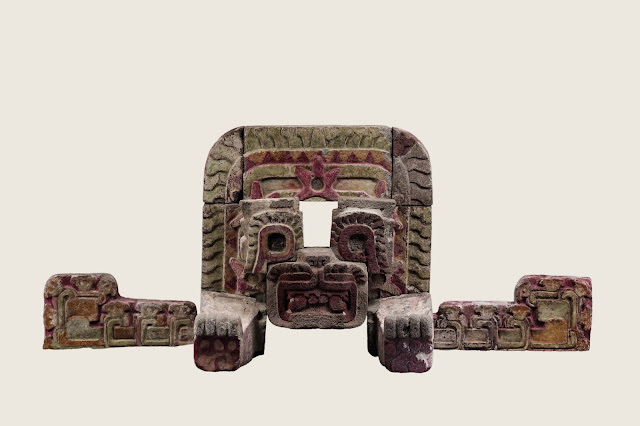 The next section, called Teotihuacan City of Gods, introduces the city’s distinct art forms that were crafted from local and imported materials. 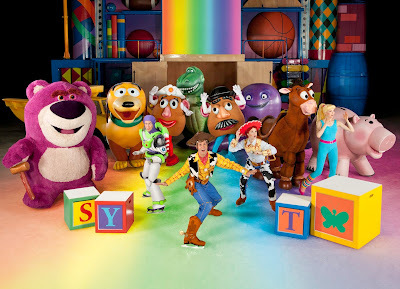 Also featured are deities that personified natural forces of rain, lightning, fire, water, and maize. The ubiquitous Storm God was associated with water and fertility but also could spark lightning, create fire, and inflict destruction. The Feathered Serpent was a hybrid entity related to rain and moisture-laden clouds. Another supernatural is the Old Fire God, who embodied the cleansing and regenerative qualities of fire. Sculptures of the Old Fire God appear in many sizes and locations at Teotihuacan, from the top of the Sun Pyramid to myriad domestic contexts. The following galleries focus on the three main pyramids at Teotihuacan: Feathered Serpent Pyramid, Sun Pyramid, and Moon Pyramid. Small in comparison to the Sun and Moon pyramids, Feathered Serpent Pyramid the was once covered on all four sides in elaborate, monumental carvings of undulating feathered serpents, each carrying a mosaic headdress on its back. Their bodies are surrounded by shells indicating they are in an aquatic environment—perhaps the primordial waters of creation—and their heads emerge from feathered portals that indicate the creature is arriving to the earthly realm from another dimension. 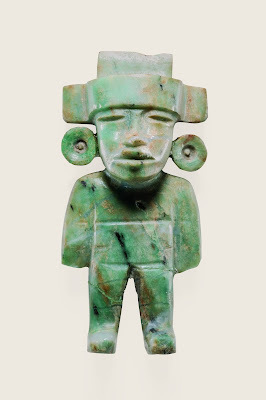 Many jade and greenstone objects were deposited in the sacrificial offerings buried within and below the Feathered Serpent Pyramid. 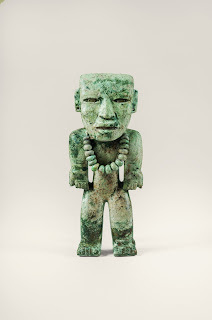 Deemed extremely valuable materials throughout ancient Mesoamerica, they were imported from great distances and prized for their lustrous green colors and association with maize. Greenstone figurines and jewelry discovered in excavations led by Saburo Sugiyama appear in this gallery. Around 350 CE, the building’s facade was destroyed, the interior was looted, and an additional structure was added to the building’s front. But the Feathered Serpent remained a significant entity in the city, appearing in murals in residential compounds and on ceramics and other media. The Sun Pyramid is Teotihuacan’s largest, and one of the most massive structures of the ancient world. Built around 200 CE in a single construction effort, its square plan covers more than 500,000 square feet, and it stands over 200 feet high. Archaeologists have studied the pyramid since the late 19th century, but recent excavations directed by INAH archaeologist Alejandro Sarabia González continue to shed light on this immense structure. A sinuous tunnel lies beneath the pyramid. Although much smaller in volume than the Tlalocan tunnel, the two contemporaneous passages both are oriented east-west, extend over 300 feet, and may share symbolism. Recent excavations above the tunnel have uncovered offerings of precious greenstone objects arrayed with other materials. Large sculptures were found at the pyramid’s summit, including two greenstone slabs of monumental proportions and an Old Fire God sculpture. Outside the pyramid, sculptural programs relating to fire, jaguars, and human hearts indicate the Sun Pyramid was used to celebrate solar and New Fire rituals. The Moon Pyramid is Teotihuacan’s second-largest structure, with a rectangular base covering more than 250,000 square feet and reaching 141 feet high. Excavations co-directed by Rubén Cabrera Castro and Saburo Sugiyama revealed several construction phases in which major dedicatory offerings were deposited. Around 250 CE, the pyramid was greatly enlarged, indicating a period of increasing wealth and political centralization. This construction was marked by a dedication event involving the sacrifice of humans and predatory animals. The offerings, which also included objects of exceptionally precious materials such as greenstone, obsidian, slate, and pyrite, were carefully arranged, and some seem to be associated with rituals relating to the origin of the cosmos. One dramatic offering, recreated in the gallery, comes from a burial site excavated by Sugiyama’s team. At the center of this offering was a male figure made of mosaic serpentine and greenstone paired with a female figure in obsidian that were surrounded by 18 obsidian eccentrics in the shapes of feathered serpents and lightning bolts. Teotihuacan was largely made up of single-story residential and administrative buildings that varied in size and level of luxury. A separate gallery focuses on the city’s Residential Compounds and Administrative Centers. The Street of the Dead Complex, for example, was an administrative center of monumental scale that crossed the Street of the Dead, the city’s north-south axis; La Ventilla was a relatively high-status neighborhood southwest of the ceremonial core. These complexes, which housed many of Teotihuacan’s residents in multi-apartment dwellings, were Teotihuacan’s social and economic engines. Few of the more than 2,000 such complexes in the city have been completely excavated, but there is evidence they housed individuals from various social levels and had residential, religious, and administrative functions, with kitchens, storerooms, and courtyards with altars for venerating patron gods. Archaeologists also have found evidence for high levels of craft production, including the making of pottery vessels, shell ornaments, baskets, and garments or the raising of animals like rabbits. Featured in this gallery are a variety of objects from these residences, including censers that were decorated with a human face within a frame adorned with mold-made plaques of birds, butterflies, temples, or feathered disks. 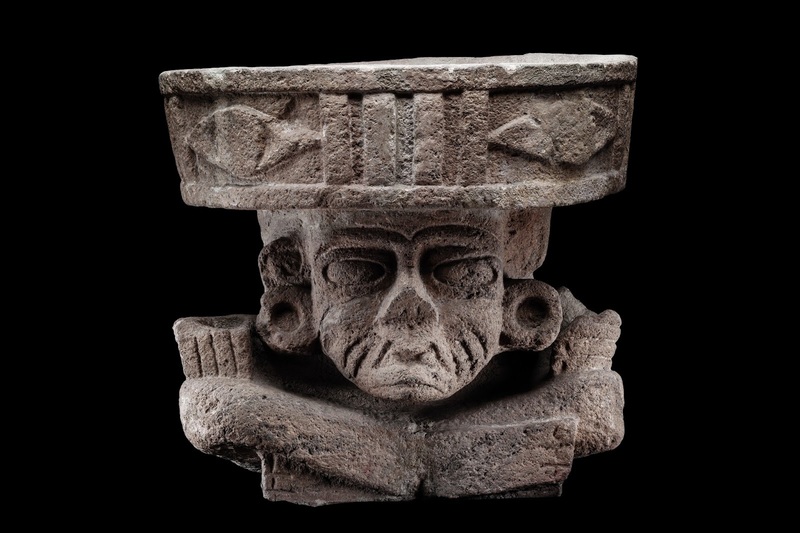 Teotihuacan residents used these censers to burn offerings to honor deities and ancestors. Another gallery, Painted City, highlights the painted polychrome murals that decorated many of the city’s apartments and administrative centers, including Techinantitla, a high-status compound in the northern section of the city center. Techinantitla was the site of large-scale looting beginning in the early 1960s, and the compound’s murals subsequently circulated throughout the world’s art markets. A 1976 bequest to the de Young revealed a large quantity of previously unknown mural fragments. 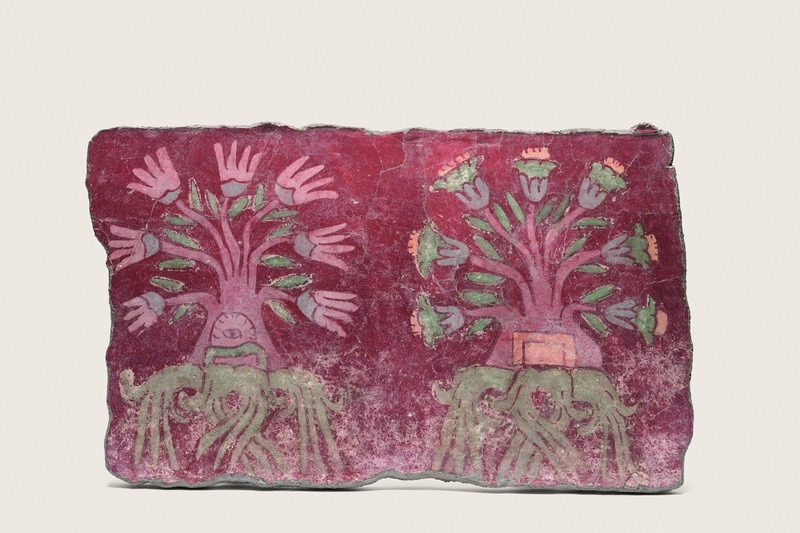 Negotiations led to the repatriation of about 70 percent of those murals to Mexico and a collaborative relationship that has produced exhibitions such as this one. City and Cosmos reunites three sets of murals of feathered serpents with flowering trees, which are on public view for the first time in more than a thousand years. Also in this gallery are stucco-painted polychrome vessels from LACMA’s collection painted in a technique similar to the murals. Another section of the exhibition focuses on the City's Periphery and Beyond. Residential compounds outside Teotihuacan’s core show diversity of people, goods, and economics, yet each reveals connections with the city center. The working-class residents of Tlajinga, on the city’s southern periphery, specialized in the mass production of obsidian blades. This volcanic glass played a crucial role in Teotihuacan’s economy, and the people living in Tlajinga owned luxury goods typically seen in more elite compounds. Also on the periphery were neighborhoods that were ethnic enclaves for people from other places in Mesoamerica. Archaeologists found that people in these compounds participated in local material culture and imported goods from their home regions. Their use of foreign goods and practice of foreign rituals were generally related to rites of passage such as birth and death. Biological evidence shows continuous immigration of people into Teotihuacan, and material evidence of foreign goods in the city and of Teotihuacan goods in distant regions reveals active exchange of raw materials and finished products with other regions in Mesoamerica. City and Cosmos concludes with the Xalla Compound. Located east of the Moon Pyramid plaza and north of the Sun Pyramid, Xalla may have been the site of elite workshops for lapidary craftsmen, painters, and garment-makers. Many objects from Xalla bear evidence of a violent, destructive event that marked the beginning of Teotihuacan’s collapse. Around 550, the city’s ceremonial center was burned, and ritual objects, such as the large marble standing figure featured in this section, were intentionally smashed. The unusual and striking object is one of the largest sculptures in precious stone found at Teotihuacan and may portray a local patron deity. The figure was once installed on a temple, but archaeologists found it smashed to pieces and scattered. Following the great fire, Teotihuacan collapsed and much of the population left the city. But the site itself continues to lives on as a powerful model of ancient Mesoamerican urbanism. This exhibition is organized by the Fine Arts Museums of San Francisco and the Los Angeles County Museum of Art, in collaboration with the Secretaría de Cultura through the Insituto Nacional de Antropología e Historia de México. This exhibition has been made possible in part by a major grant from the National Endowment for the Humanities: Exploring the human endeavor.